Among the things Jessica Lall managed to accomplish through her heartbreaking death was to reinforce the cynicism of an entire country. The candlelight vigils and the subsequent punishing of her murderer came about much later - after the message was clear: in case of crime, have powerful parents or remain a judiciary statistic. In No One Killed Jessica, Raj Kumar Gupta starts off milking the poignancy of the case quite well. What he also tries is to put together the tragedy of reality and the hopefulness of fantasy. Jessica (Myra Karn), a bargirl and aspiring model, is shot dead at a party by a politician's son Manish Bharadwaj (Mohammed Zeeshan Ayyub) because she refused to serve him a drink. 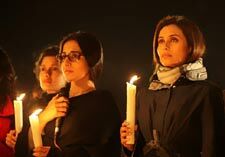 What everyone assumed would be a cakewalk of a case for the victim's kin turns into a cruel joke - the 300 eyewitnesses at the party deny being even present there at the time of the murder, with only 7 of them firmly assuring Jessica's sister Sabrina (Vidya Balan) that they will tell the truth in court. Sabrina is battered by the futility of the whole thing, and her misplaced and naive faith in justice is proved wrong when the 7 witnesses start turning hostile. When all hope is lost, a celebrity news reporter Meera (Rani Mukherji), who had once dismissed the case as "crime beat stuff", is now determined to get the guilty punished. It is the stuff movies are made of. And sad but true - it is also the stuff a Madhur Bhandarkar film can be made of. Which is the territory Gupta dangerously veers into. If you find No One Killed Jessica a compelling watch, it is only thanks to the actual drama that unfolded for a decade. The director is safe for as long as he keeps dissecting the disastrous court proceedings, as long as he has Vidya Balan evoke the most heartfelt of sympathies for the real-life Lall family, and as long as he plays Amit Trivedi's brilliant haunting score in the background. Then comes the second half, when a Madhur Bhandarkar-esque shallowness creeps in. Once the grief is out and Meera's "investigative journalism" (namely, a few sting operations and an anonymous tape of a confession in her mailbox) comes in, the story gets as diluted as the Jessica Lall case did. The heroic mediaperson bit was badly scripted, and undoes everything the director built in the first half of the flick. Slowly you realize that it was probably only Vidya Balan and Amit Trivedi who kept the film together. The movie turns into nothing more than a teleserial after the interval; when both Balan and the music are largely missing from the proceedings. Vidya Balan needs to do nothing more than be perennially downcast (and badly-dressed), and yet, she steals the show. Ditto for the actors who play Lall's gracefully grieving parents. The haggard policeman and the star witness (Neil Bhoopalam) were strokes of great casting, as well. And we're glad to see Rani Mukherji back, but her profanity and aggressive bitchiness turns out to be a mere prop. The actress is miscast in a role that clearly needs someone less prim-and-proper, and probably younger. Let's be fair - No One Killed Jessica does have its heart-rending moments. Plus, you could sit through the flick to see how Amit Trivedi has arrived in the industry, how Vidya Balan has gone past having arrived, and how Rani Mukherji is probably exiting. Only, we hope Aarushi Talwar and Ruchika Girhotra get a better deal on screen. Media is quite powerful. Sometimes, they do use it for the benefit of the masses, keeping aside a bit of their commercial interests. I hope they can do wonders in Arushi's case also. I just hope that media and public come together to do a similar job in arushi's case. I hate CBI for being such a failure. fullhyd.com has 700,000+ monthly visits. Tell Hyderabad what you feel about No One Killed Jessica!